If an album is called Retrofuture, then that can only mean that “old” music (in the style of the 70s / 80s) has to be in the “new” garb (modern production, digital recording, etc.). 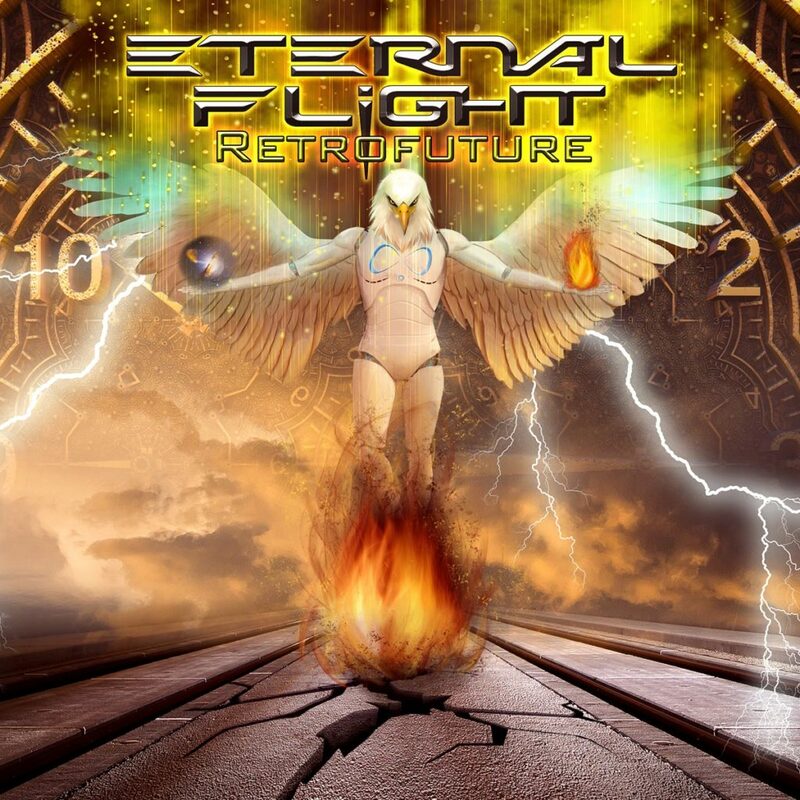 The fourth work of the Frenchmen Eternal Flight is not that completely wrong, but the production is not completely modern, as the modern triggering and re-amping was not used when recording. After a short intro, the Frenchmen start heavy with “Poison”. In addition to the polyphonic sing-along chorus, there are a few Halford memory screams and a short guitar solo. With “The journey” the journey continues a bit more moderately. Acoustic intro followed by a mid-tempo song. After that, the title song is already booming out of the speakers. After “Painkiller” – like drum intro, however, no wrecking ball song develops, but a rather doomy held song, also thanks to the keyboard background and the sedate but powerful riffs. The “Nightmare king II” starts quietly, then takes a momentary drive, only to then switch back to quiet fields. In the chorus, a few epic riffs are unpacked. Unfortunately, the song is a bit overloaded by the changes. The machine God starts with a short bass solo, but otherwise offers no surprises. “Routine of darkness” is then a piano-underlaid ballad that manages to create a dark atmosphere. Sinful, it continues with “Sinner”. Again a dark, doomy song. With “Danger calling” there is finally a faster song that invites you to headbang. Then you will be seduced by a “succubus”, a demon that feeds on life energy and therefore couples with a human at night. Fittingly there are beguiling female vocals. One of the songs that stands out from the rest of the album. “Labyrinth” is then again only average and not really convincing. Shortly before closing “Pandora’s box” will be opened. And with its complexity, this song is one of the better ones. The conclusion then forms the “Angels of violence”. One of the faster songs of the album with sing-along chorus. Unfortunately there are not too many of the strong songs on Retrofuture. It would have been better to put less on mass and more on class. So on the fourth work of the band too many average songs are frolicking, as that a higher rating would have been justified. Potential is finally there.